This book arrives at just the right time to facilitate understanding of performance-based fire risk assessment in buildings – an integral part of the global shift in policy away from traditional prescriptive codes. 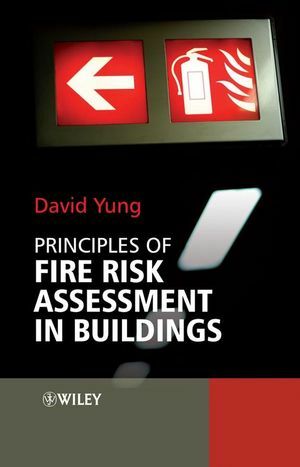 Yung, an internationally recognised expert on the subject of fire risk assessment, introduces the basic principles and techniques that help the reader to understand the various methodologies that are currently in place or being proposed by different organisations. Through his illustration of basic principles and techniques he enables the reader to conduct their own fire risk assessments. He demonstrates how the probabilities of fire scenarios are assessed based on the probabilities of success and failure of fire protection measures that are in place. He also shows how the consequences of fire scenarios are assessed based on the intensity and speed of fire and smoke spread, the probability and speed of occupant response and evacuation, and the effectiveness and speed of fire department response and rescue efforts. Yung’s clear and practical approach to this highly topical subject enables the reader to integrate the various tools available into a quantitative framework that can be used for decision making. He brings an invaluable resource to all those involved in fire engineering and risk assessment, including students, academics, building designers, fire protection engineers, structural engineers, regulators and risk analysts. David Yung is currently the President of his own consulting company, Yung & Associates Inc. He has worked in fire research and fire risk assessment for over 20 years. From 2002 to 2006, he was Research Leader of Fire Science at the Australian national research organization CSIRO in Sydney, Australia. Before that, he was a Senior Research Officer and Group Leader of Fire Risk Assessment for 17 years at the National Research Council Canada (NRCC) in Ottawa. He led a team that developed one of the world’s comprehensive fire risk-cost assessment models, called FiRECAM. Before joining the fire research group at NRCC in 1985, he spent seven years at the Argonne National Laboratory in the USA, and three years at the Chalk River Nuclear Laboratory and NRCC, conducting nuclear and solar energy research.The author's work is mentioned in the book History of Fire Protection Engineering, published in 2003 by the National Fire Protection Association (NFPA) and the Society of Fire Protection Engineers (SFPE) in the USA. He is a member of the NFPA Technical Committee on Fire Risk Assessment Methods. In September 2003, he was given the 'Hats Off' award by SFPE for his service as the Editor-in-Chief of the Journal of Fire Protection Engineering. In May 2001, he was elected a Fellow of the SFPE for his achievement in fire protection engineering. He has over 100 publications in fire, nuclear and solar energy, and desalination and water purification. He serves on the editorial boards of three major international fire journals and is the past Editor-in-Chief of the Journal of Fire Protection Engineering.He holds a B.Eng. from McGill University, an M.A.Sc. from the University of Toronto, and a Ph.D. from MIT, all in mechanical engineering. In addition, he is a licensed professional engineer in the Province of Ontario, Canada and a member of the American Society of Mechanical Engineers. PART I: SIMPLE APPROACH TO FIRE RISK ASSESSMENT. 2. What is Fire Risk Assessment? 2.2 What is Fire Risk Assessment? 3. Fire Risk Assessment Based on Past Fire Experience. 3.2 Based on Past Fire Experience. 3.3 Based on Fire Incident Data. 4. Qualitative Fire Risk Assessment. 5. Quantitative Fire Risk Assessment. PART II: FUNDAMENTAL APPROACH TO FIRE RISK ASSESSMENT. 6. Fundamental Approach to Fire Risk Assessment. 7.3 Fire Model Input and Output Parameters. 7.5 Automatic Fire Suppression to Control Fire Growth. 9.2 Smoke Spread Characteristics and Modelling. 9.3 Smoke Control Systems to Clear Smoke in Evacuation Routes. 10.2 Occupant Evacuation Characteristics and Modelling. 10.3 Occupant Safety Measures to Expedite Occupant Response and Evacuation. 11.2 Fire Department Response Time and Resources. 11.3 Occupant Fatality and Property Loss Modelling. 11.4 Fire Protection Measures to Provide Effective Occupant Rescue and Fire Extinguishment Efforts. 12.2 What Are the Uncertainties? 13.3 Alternative Fire Safety Designs. 13.4 Impact of Inspection and Maintenance on System Reliability. 13.5 Impact of Evacuation Drills on Early Occupant Response and Evacuation.